Asphalt paving involves several steps that help you to pave the way. The first step during paving operation is to ensure there is a continuous flow of material and the machines are appropriately set. • Supplying of the paving mix: Our company South Bend Sealcoating uses a truck to run over the pathway before every other person in the paving team; the truck fills the paver’s hopper with Asphalt. Our team uses two mutually independent conveyors to transport the asphalt to the rear. The screw conveyors that are individually controlled help to spread the asphalt evenly between the paver and screed. During this process, the temperature should be 110 °C, to allow time for sufficient compaction. To ensure paving operation is done in the best time frame, the hot mix is transported by a charging truck while it is covered. For continuous paving, the rate of mixing asphalt ought to be higher than the laydown capacity. 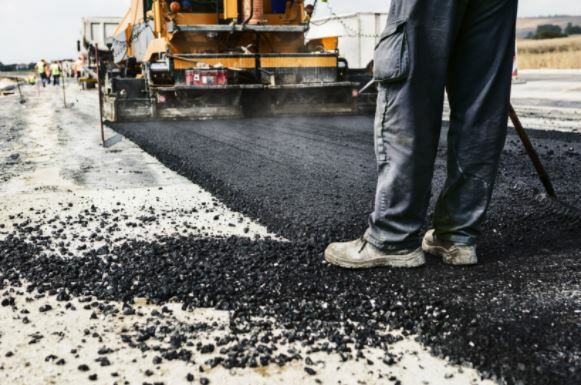 If paving is not done continuously either due to depletion of paving material, it will result in disruptive later joints due to the cooling of the already paved layer. • Using a road paver: For us to avoid sticking to sensitive parts of the machine, we ensure that all paving units are hot before starting the operation. Actuate the compacting system in the screed separately especially the long compaction screeds which help in achieving the best compaction. It will, in turn, cause the roller to work efficiently in the final degree of compaction. • Final compaction: High-density screed helps the roller to achieve the ultimate density as requested by the client. The road paver is meant for high density or moving at a fast speed which affects the required number of roller passes. The Cost of Asphalt Paving: The cost of asphalt paving ranges from $2,723 - $5,927 while the cost of hot mix asphalt per ton is $21.74. Depending on your preference you can use asphalt on your driveways, which will cost about $2.50 - $4.00 /sq. The cost of installing asphalt in your path is cheaper than concrete. Driveway asphalt installation• Evaluate the site for water runoff and grade• Lay the foundation on the driveway which ensures a stable surface for supporting the pavement• Find a contractor like us. We are reputable and will follow the installation guidelines• Carry out a conventional seal coating which helps to maintain your asphalt driveway.• Fill in the cracks to prevent water from infiltrating under the asphalt surface.• Repair potholes immediately they appear• Carry out an asphalt overlay to refresh the dull or worn out appearance. The cost of paving a driveway: The cost varies from one region to another depending on the cost of labor and local material. Asphalt driveway paving costs $2-$6 per square foot installed. Resurfacing: Even with regular crack filling and seal coating practices, your asphalt driveway will crack and corrode hence requiring a resurfacing. This practice will involve the laying of a new asphalt layer over the old one. It consists of the crack filling to form a flat base then apply asphalt over the surface. Use a massive rolling machine to flatten the layer. The cost of resurfacing depends on factors such as location and season; it cost from $1 to $2 per square foot.